Metrics: PDF 139 views	| ? This article has been corrected: During the assembly of Figure 2F, the same image was inadvertently used for both the mock and nonspecific RNA control (shNC) in vehicle (DMSO) treated groups. The proper Figure 2 is shown below. The authors declare that these corrections do not change the results or conclusions of this paper. Original article: Oncotarget. 2017; 8:164-178. DOI: https://doi.org/10.18632/oncotarget.10516. Figure 2: 4-OHE2-induced HO-1 expression is associated with cell proliferation. (E) The representative images of migration assay are from MDA-MB-231 cells transfected with control vector (pcDNA) or HO-1 plasmid in the absence or presence of ZnPP (10 μM) for 12 h. F-G, The anchorage-independent cell transformation assay was performed in MCF-10A or MDA-MB-231 cells as described in Material and Methods. Colonies were counted by using an inverted microscope (Nikon Diaphot 300). (F) MCF-10A-mock, MCF-10A- shNC, or MCF-10A-shHO-1 cells were treated with DMSO or 4-OHE2 (20 μM) once every 3 days for 3 weeks. Scale bars: 200 μm. n = 4; *P < 0.001. 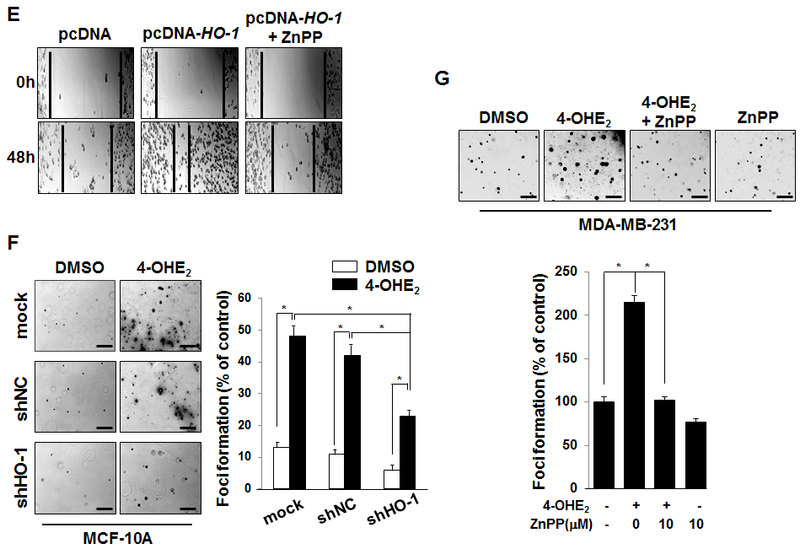 (G) MDA-MB-231 cells were treated with DMSO, 4-OHE2 (20 μM), or ZnPP (10 μM), separately or in combination. Scale bars: 200 μm. n = 4; *P < 0.001.